You need to know that your retirement plan will really work. You’ve probably given some thought to retirement. You may have tallied up your projected Social Security and other income, and maybe thought about how much you could draw from your retirement savings. But how confident are you that you’ll always have enough money? Do you know that your plan will really work? 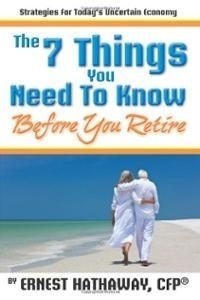 You need to know how to maximize your retirement income. You may be used to looking at your nest-egg in terms of how much you’ve been able to accumulate. But the real question is, how much income will that account safely generate? What can you do to increase your income without taking unreasonable risk? You need to know when you have enough money. When can you confidently retire? How much money will you need? Will you have enough to keep up with inflation? What about increasing health care costs? How can you calculate all the variables so that you can have a higher degree of confidence that you are well set up for life? You need to know what investment strategies to use. Is the stock market a good way to go? Or are bonds the key to retirement? What about real estate, commodities, or annuities? What is the best way to get reasonable growth without too much risk? You need to know how to find a financial advisor that you can trust. Today’s complex financial world produces a bewildering array of products and strategies. Could you benefit from reliable guidance that you know you can trust? You need to know what your family will do after you are gone. Most of us have people that we love and want to provide for. How can you know that your affairs are in order and that your loved ones will be taken care of? You need to know how to pay less income tax. We all know that income taxes are necessary, but we would also like to be able to take advantage of some of the loopholes that we only hear about. Would you like to know how to minimize your income taxes?